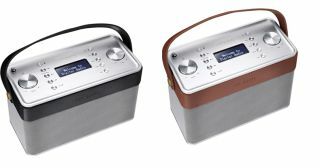 Ted Baker Audio unveils Finisterre DAB Bluetooth radio | What Hi-Fi? After announcing the launch of the Dover earphones, the Rockall over-ear headphones and the Fastnet Bluetooth speaker, Ted Baker Audio has expanded its product range with the release of a new DAB radio with Bluetooth. The Finisterre comes with DAB, DAB+ and FM radio tuners, as well as Bluetooth connectivity; the latter allowing you to wirelessly stream audio from compatible devices. In keeping with the bespoke style of Ted Baker Audio's other products, the Finisterre is made from brushed aluminium and genuine leather detailing. It is also designed to produce a "warm acoustic sound, reminiscent of a good old-fashioned valve table radio". As well as receiving audio from the radio tuners and Bluetooth, other devices can be connected to the unit via a 3.5mm auxiliary input. A 3.5mm stereo headphone output is also onboard, while a USB port allows for future firmware updates. Clock and alarm functions can be found on top, along with a sleep function. The Ted Baker Audio Finisterre DAB radio is available now in brushed silver with black leather or brushed silver with tan leather finishes for £200.